Gastric support for horses developed by Vets and leading equine nutritionists. GastroKind contains 9 active ingredients to promote gastric health and comfort. This product won a BETA innovation award in 2017. GastroKind has been developed by the leading veterinary scientists, nutritionists and vets. The unique formula promotes a healthy gastric environment, soothes the stomach walls, helps control acidity and supports the natural anti-inflammatory processes in the gut. 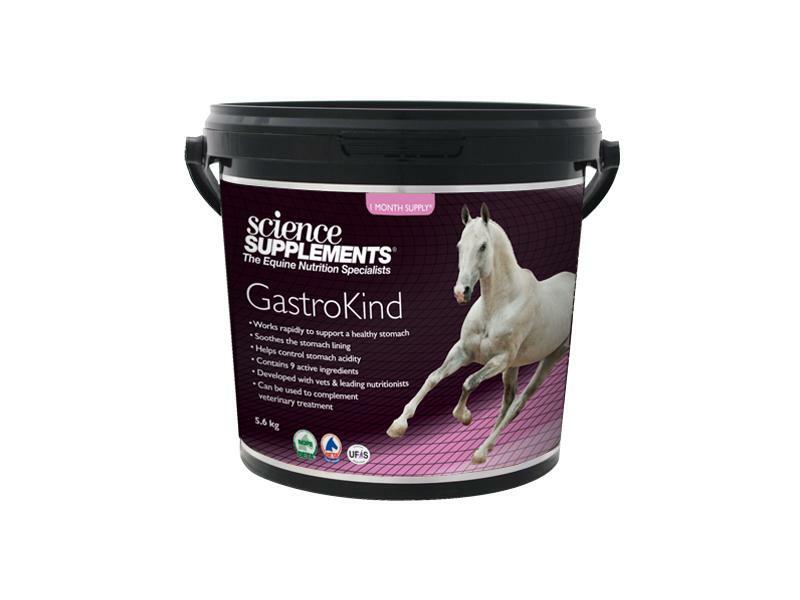 Gastrokind can be fed to all horses during or following veterinary treatment to help encourage a healthy stomach environment and is a natural alternative to maintain a healthy gut. Ficus glomerata extract - Studies using an extract of Ficus glomerata have been shown to support the stomach lining, promote a healthy gastric environment and help control acidity. Apple Pectin & Lecithin - Pectin-lecithin complexes have been studied in horses and support the total mucus concentration in gastric juice (Koller et al. 2010). Mucus helps protect the stomach lining from acid. Saccharomyces cerevisiae - Yeast cells are high in a small protein called thioredoxin, which has been proven to support the gastric lining. MgOH - Magnesium hydroxide when used in combination with a pectin-lecithin formulation and Saccharomyces cerevisiae can support a healthy stomach. Alfalfa - Alfalfa has buffering capacity which means it can help maintain the stomach walls. Vitamin C – Alongside Vitamin E, Vitamin C is the other major anti-oxidant. The antioxidant Vitamin C has also been shown to support the gastric lining whilst not interfering with the positive effects of omeprazole (Kohler et al. 2010) therefore ideal for use alongside veterinary treatment. Vitamin E – Vitamin E has been shown to aid the natural process of reduction of stomach acidity, acid production and gastric acid volume (Cuevas et al, 2011; Huilgol et al. 2014). Vitamin E in high feeding rates has significant anti-oxidative action. Selenium - Selenium is an important co-factor the effective function of antioxidant enzymes and Vitamins such as Vitamin E.
Feed the rate below for 7-14 days before reducing to a maintenance dose listed above. If symptoms re-occur or increase in severity, then you should contact your veterinary surgeon.